I don't know what happened, but all of a sudden I've become utterly obsessed with fonts and all things typography! I notice gorgeous eye catching fonts everywhere! Magazines, books, posters, stores, packaging- it's kind of all I see! I've even, hehe, said aloud once or twice, "Hey, that's the __________ font!" Oh boy. What?!?! Who have I become? My husband, that's who. He's obsessed with typography- actually requested (and received) a book for his birthday last year FULL of nothing but 60's and 70's popular fonts. I laughed at him then. Now...I merrily stick my foot in my mouth. Anyway, now if you're anything like me, you fiend for new fonts. You search the web and Pinterest for any font you can get your hands on. Even more, you giggle with delight at FREE new fonts. Squeal! Well friend, you're in luck! Luck, I say! 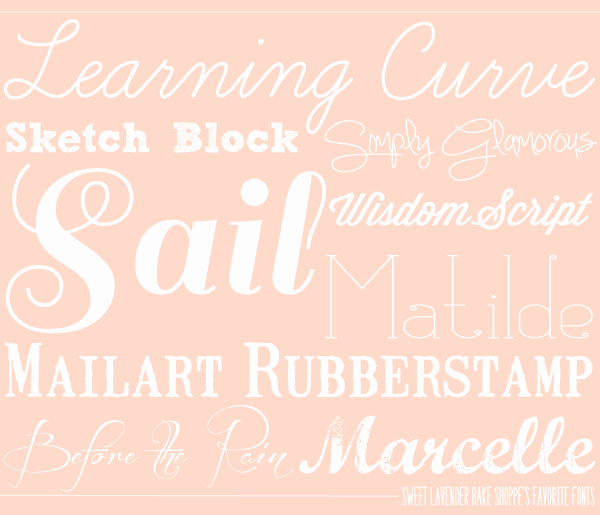 Here are some of my favorite fonts- fonts that you most likely have seen time and time again on my blog! Oh, and yeah- they are totally free for all your blog picture bedazzling fun! Oh deary me, I do love a good free font! Thanks for bringing these to my attention - they're a great selection! I love fonts I'm mildly addicted to them.